Packed with argan butter, argan oil, and coconut-derived fatty acids, this little blue pot of gold goes a long way in providing long-lasting conditioning to soften the hair to leave it more manageable and less unruly. Formulated for use once a week (or as needed), simply leave in for five to 10 minutes on towel-dried hair and then rinse well. Moroccanoil Smoothing Mask, $46, at Sephora. Blending avocado and calendula extracts, Dove’s new nourishing shampoo and conditioner formulas are inspired by the longstanding tradition in Latin America of adding the culinary staples to beauty routines. The two ingredients together are revered for their anti-breakage properties, and their ability to fortify the hair from the root. Dove Nourishing Rituals Shampoo & Conditioner, $5 each, at mass drugstores. Imagined after a night attending a costume party with a phone cord wrapped in her hair in place of a hair elastic, co-founder of Invisibooble Sophie Trelles-Tvede discovered that even after falling asleep with the phone cord tied in her hair, it didn’t leave the kink that her traditional hair elastics did. Using a similar coil design, the Invisibobble is non-soaking and comfortable to remove which causes less hair damage. It’s also perfect for when you skip the blow dry and throw it up, but would also like the option of letting it loose later. Invisibobble Slim, $10, at Sephora. Taking a cue from skincare technology, this leave-in-conditioner prevents breakage and split ends using a patented hyaluronic acid technology that creates a moisture barrier to protect the hair from daily pollutants and environmental aggressors. Coupled with pure coconut milk to soothe and nourish, the result is smooth, shiny, frizz-free hair. An extremely common side effect of extreme temperates, a dry itchy scalp can get the best of all us this time of year even if we aren’t prone to dandruff. Formulated with avocado oil to nourish and micro zinc particles that deeply penetrate the scalp to gently cleanse, protect and moisturize, Head & Shoulders latest shower duo promises 100 percent flake free hair with regular use. 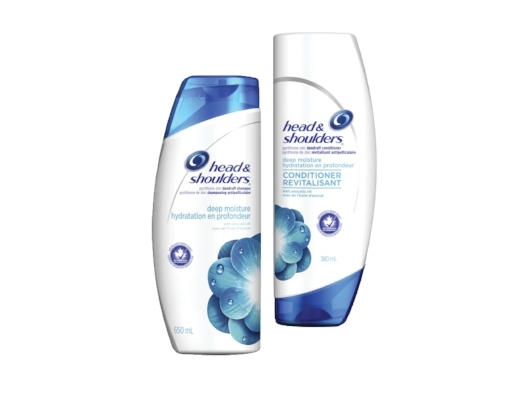 Head & Shoulders Deep Moisture Shampoo & Conditioner, $10 each, at drugstores.